The delightful church of St Mary Magdalene is situated just to the south of Arundel in the small hamlet of Tortington. Built in the 12th century, this small church really is the most wonderful time capsule. Above the ornate Norman entrance are a set of ornate carvings. Inside, creatures unlike anything found in nature peer down from the chancel arch. They are called ‘beakheads’ – boggle-eyed monsters with beaks, tongues and squid-like tentacles that frown and glare at visitors below. Another treasure, one that is easily missed, is found in the chancel. Here you will find one of the very best windows by the celebrated artist Charles Eamer Kempe. Dating from 1896 it depicts St Richard of Chichester holding his pastoral staff in one hand and his cathedral church in the other. Finally, before you leave take a look just to the east of the entrance. There you’ll find a fine 12th century font carved out of Caen stone. 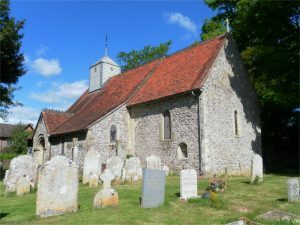 Although the church has now passed into the care of The Churches Conservation Trust, it is still occasionally used for worship and events organised by the Friends of Tortington Church. The church is open to visitors from 10.00am to 4.00pm each day.